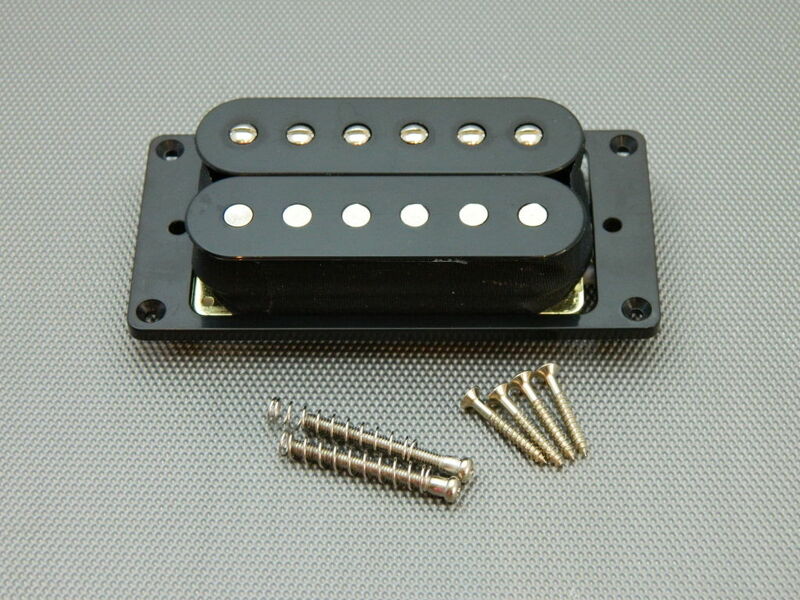 The Ironstone open frame PAF style humbucker design features a powerful 15.5 K Ohm bridge and neck (available individually and as a set). The tone is vintage dark and velvety – think Moore, Kossoff, Page and Walsh! These Alnico V humbuckers feature 4 wire configuration for coil tapping, phase changing etc as well as 6 adjustable pole screws per pickup. 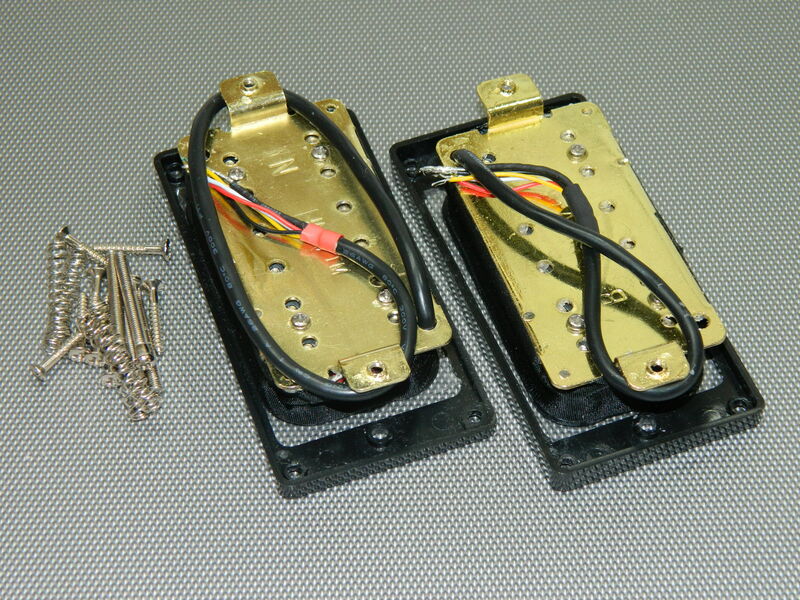 Smooth dark Alnico V tones with an ocean of bottom and great attack when played through pedals / valve amps. They are also particularly responsive to height, tilt and pole piece adjustments to further enhance tone. 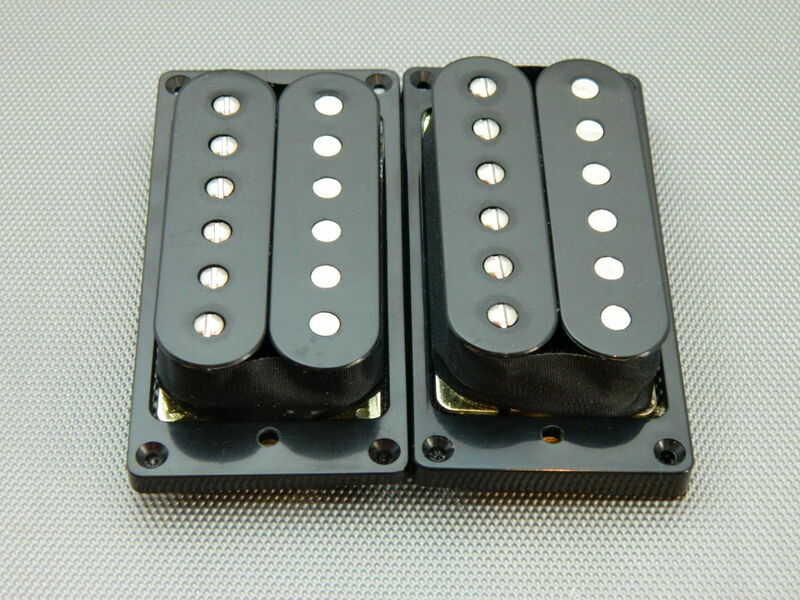 And if you are looking for an HSH pickup set, that is also available as a humbucker option below. 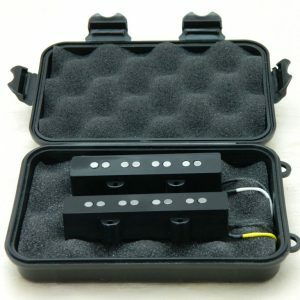 HSS sets also available with Platinum or Hybrid single coils. Please contact us for details and prices. 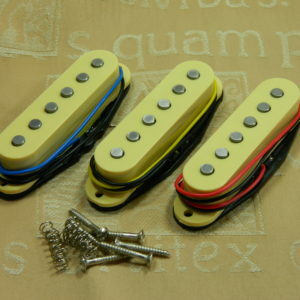 These humbucker pickups, like the Ironstone Stratocaster & Telecaster range, are based on Alnico V magnet Pole Pieces. But add to that a stunning 15.5K winding resistance, full 4 wire connectivity and adjustable pole pieces for a classic vintage tone. Pole piece spacing is 50mm (Neck) and 51.5mm (an F spacing Bridge). Unlike many on the market these are standardly supplied complete with black mounting rings as well as all required springs and mounting screws. The 4 wire connection means that they are hugely versatile, and detailed support pages can be found on this website. Connecting wire lengths; Bridge 18cm, Neck 26cm approx. I recently recommissioned my faithful 1981 Ibanez Musician MC-150, that came with Ibanez Super 88 humbuckers. 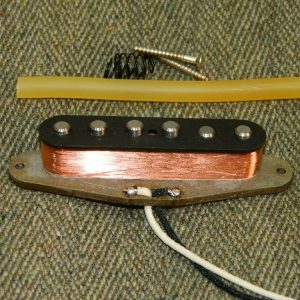 To my todays’ taste, those original pickups, while not bad, sound much too treble-heavy, so I decided to swap them for Ironstone humbuckers, looking for more warmth while keeping a vintage tone for that vintage guitar. That was a good idea! The twangy sound of the MC-150 (due to its neck-through-body build, I guess) is still there, but with much more warmth and roundness than before, and more power, too. 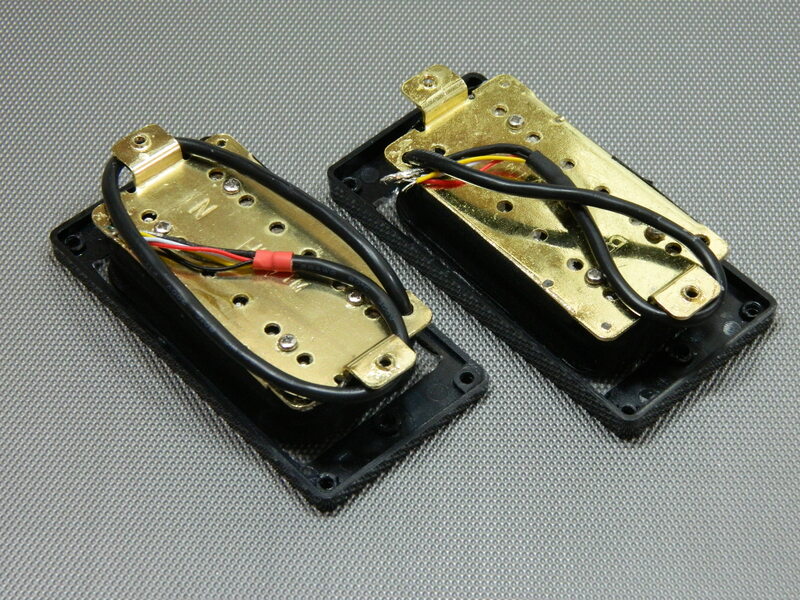 These Ironstone humbuckers pickups have the perfect vintage rock tone, and they are an incredible value for their price. Vintage tone at a great price is what the Ironstone range is all about! Finally finished an Iceman style guitar with a set of humbuckers. After figuring out that I had the plug in wired backwards i turned the guitar on and what a difference! Beautiful tones and notes came forth. I took the guitar to a local shop where there was a person who could really play. He was impressed with the pickups and I enjoyed the sounds coming from the guitar! Always something very satisfying (and at the same time slightly annoying) about handing over your guitar and having another player making it sing! But it happens to us all, and now you have maybe heard more of what the Ironstone’s can do. 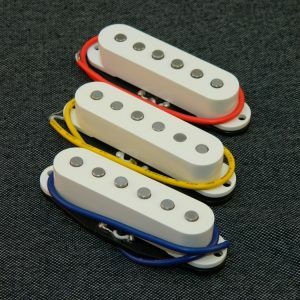 I have used both the humbucker sets and one of the stratocaster sets in my own guitars and found them both to be excellent. 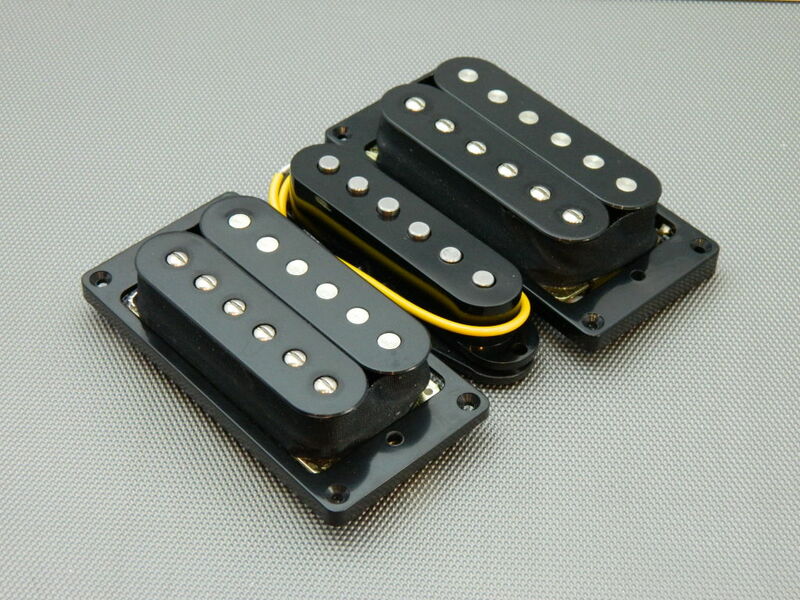 There is absolutely no reason to spend three or four times as much to get big name pickups when these are available. My bandmates love the sound of them and have suggested I put them in all my guitars. They knock the socks off the stock Gibson SG pickups in my Tribute and the Burstbuckers in my Epiphone Custom Shop SG. I run a business repairing guitars (String King Guitar Works) and it’s great to be able to recommend these to my clients. There is, of course, nothing more satisfying than to have folks who really know their guitars, both players and techies recommend pups from the Ironstone range. 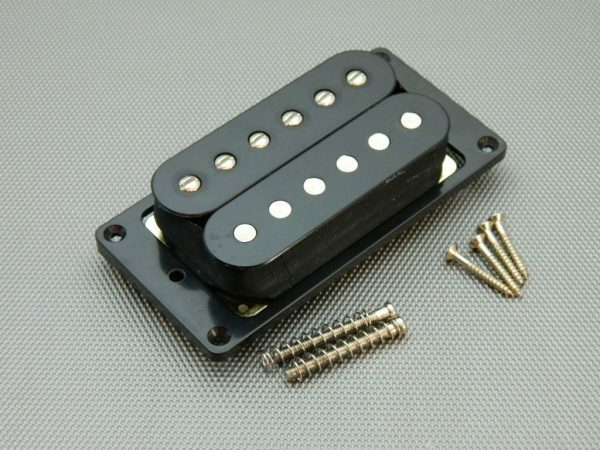 And I think I am at least unusual, if not unique at these sort of prices, to be offering a high resistance humbucker driven by Alnico V as opposed to ceramic magnets. Its a winning tone combo to my ears at least! Put some humbuckers in my Iceman copy that I made. I’m like Leo Fender. I can make them but I do not play guitars. I have a three way switch and was really impressed with the three distinct sounds. I had a professional play the guitar and he liked it so much, took pictures of it and asked me if I was going to make him one! I love the sounds. I’ve had the HH set in my Frankenstein Jazzmaster for 2 years now. The only thing I would add to my original review is that I’ve changed the volume pot on the bridge pickup from a 500k to a 1 Meg with great results (neck is still 500k). Depending on what style your playing, that might be a useful suggestion. Hi Aaron, and thanks for the update. 1MOhm pots are a great way to preserve every ounce of treble. 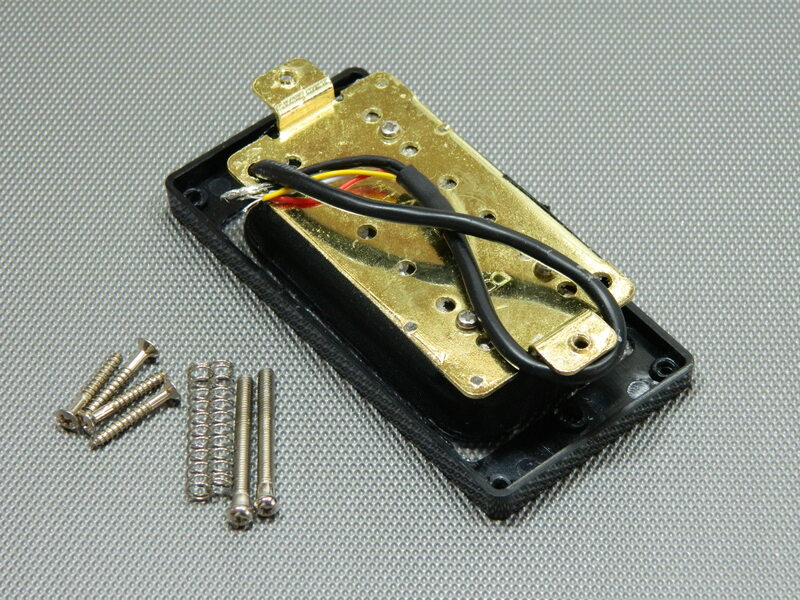 No need with a Strat, but high output / resistance humbuckers respond well to this (relatively unusual) value. Thanks for the tip. I have just finished my latest scratch project (my take on the chambered Gretch Billybo). 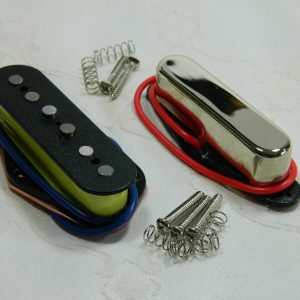 I installed these pickups into the guitar on the strength of my earlier experiences using the Ironstone strat (silver and platinum ) sets and also the tele set. Once again I am delighted with the quality of the Ironstone products, The pickups produce a fantastic range of powerful sweet tones, I also coil split them to give a wider choice of sounds and this has worked out great, its nice to have this option with the pickups.They also look great to boot.so all in all a brilliant set of pickups at a great price. Highly recommend Ironstone pickups. Cheers. Always good to see returning customers Graham! These pick ups are excellent. The difference they’ve made to my Les Paul in looks and sound is top notch. Can we have an extra 2 inches of wire on the neck pick up though ? I’m rebuilding my Telecaster soon, so I’ll be contacting you guys again. Thanks for the compliments Keith and your cable length comment noted for future batches. Very pleased with the HH set. Purchased them on the strength of the neck pickup sound in the site demos, but it’s the middle position sound that stands out for me as being worthy of the 5 star rating – it almost has a kind of sweet, vinyl-like character to it. I am a convert. 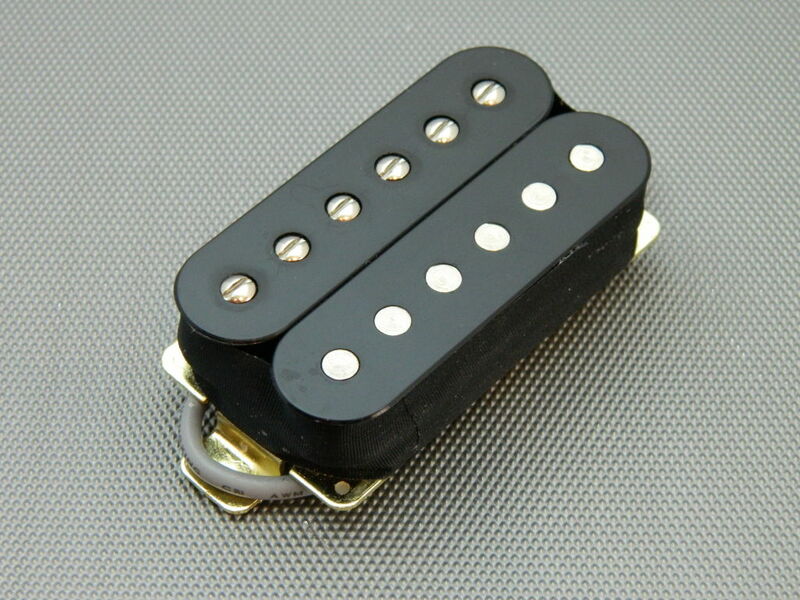 Had the new pickup from Ironstone for quite a while before I fitted it to the Les Paul. Because of strange string spacing I have a neck hummie in the bridge position. Its a combination problem as I like roller bridges and the spacing on the one I got was a bit narrow. Its a 60’s neck so that isn’t a problem but it is with pickups. Tony suggested the neck spacing and it fits! As for the sound…well its pretty amazing really. From the old gibbo ‘zebra’ pickup which must have been badly made and dull and thin sounding I now have all the fatness and woody tones that I should have had to start with. Without set up, that is fit and play it was fantastic. After proper set up its amazing. Try the ‘ah’ position on mid toggle with the volume down a fraction till you hear that ‘ah’ sound…sort of open up with a vowel sound…wonderful in fact the best I have heard. Really sings and holds for ages. Out of phase with the neck pickup is lovely. That eerie Peter Green sound, sort of hollow and yet singing. Very nice. Now ordered a push/pull pot to keep that and get the ‘normal’ sound as well. I rate this pick up highly. I was very impressed and it takes a lot to impress me. Compared to the Gibson for quality and price there really is no comparison there. Here you have quality and a really ‘workman’ price tag for all of us working musicians. Thanks Tony…but it might take me the same length of time to do a neck swap though. 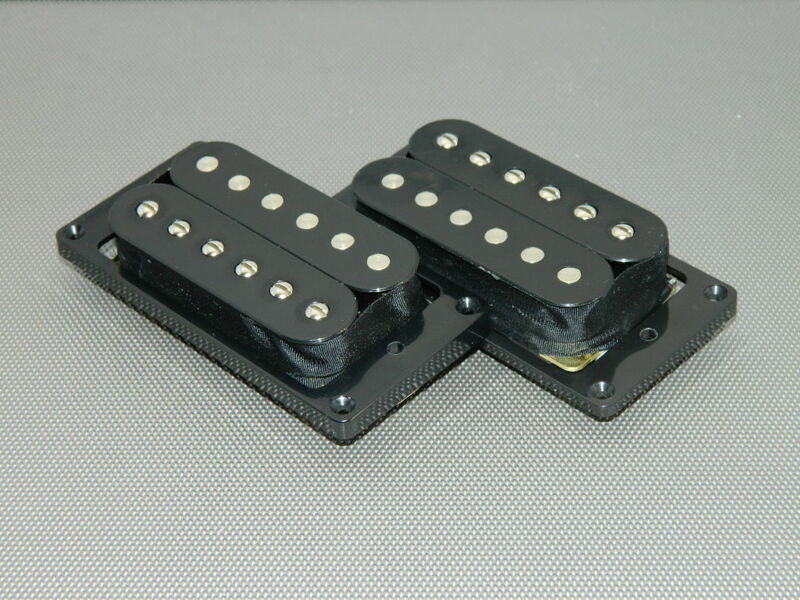 “just installed the humbucker on the bridge… nice sounding pick up, dark and loud. “They have become my favourite pick up, I’ve never used a pick up that suits not only my playing but to get the exact sound I’ve always wanted from a guitar, my band has just recorded our first ep I used the first ironstone on it:) it sounds so big!